“Paper Towns” poster. Photo Credit: 20th Century Fox. If you’re worried about crying a river with this newest adaptation of a John Green novel, you can take a breath of relaxation, as it looks like the 20th Century Fox film, directed by Jake Schreier, will be more laughs than tears, with a touch of mystery, adventure and romance added in for good measure, unlike last year’s heart-wrenching drama The Fault in Our Stars (which you’re probably still tumbling over). That isn’t to say that your heartstrings won’t be pulled; however, we don’t anticipate that you’ll need a handful of tissues to get through the on-screen drama. Working up to be another teen hit (but then again, what else would you expect from the author of four bestselling novels, one of which was Looking for Alaska?) 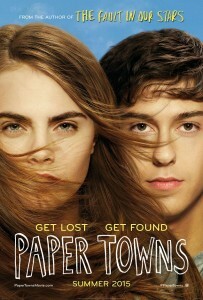 and a faithful adaption of Green’s work, Paper Towns tells the story of Margo Roth Spiegelman (played by Cara Delevingne, who is also set to star in the much-anticipated Suicide Squad flick), the girl-next-door who goes missing, and Quentin Jacobsen (Nat Wolff, The Fault in Our Stars), the boy who goes looking for her with his pack of friends. Of course, this isn’t a random sequence of events, after all, the two used to be good friends once upon a time. But like with most childhood friendships, they grew apart. Or, well, one of them did, seeing as Quentin’s feelings only blossomed further as the fun and dorky neighbor suddenly became the “queen of cool” at his high school. Yet things take a secretive and dark turn when Margo, who unexpectedly turns to Quentin for some acts of revenge and teenage rebellion, disappears shortly before graduation, but not without leaving some puzzling clues behind. Naturally, what follows is an unforgettable adventure. Finding yourself tantalized yet? If so, check out the trailer below and let us know if you’ve read the novel that this adaptation is based on, and whether or not you’ll be seeing the film once it hits theaters July 24!